The fee for the short course is $1195 by 4PM Mountain Daylight Time, Februray 24, 2013 ($1395 after Februray 24). You will be invoiced for the tuition balance. The fee covers instruction, course notes, refreshments, and continuing education units. Lodging and meals are not covered. Payment in full must be received prior to the beginning of the course. The registration fee may be paid by check, VISA, MasterCard, AMEX, Discover or purchase order (US Only). A maximum of 20 applicants will be able to attend the course due to space limitations. If cancellation is made before Februray 24, 2013 , tuition will be refunded except for the $100 deposit. Cancellations made after that date will forfeit a $150 processing fee in addition to the $100 deposit. In case of cancellation, the right to course material is forfeited. Substitutions are permitted at any time prior to the start of the course. Please be advised that if the program is cancelled due to insufficient enrollment, Colorado School of Mines will return all course fees, but will not be liable for any other expenses incurred by the prospective attendees. A detailed conceptual and mathematical description of water flow and solute transport processes in the vadose zone and groundwater will be given during the first part of the course. Hands-on computer sessions will then provide participants an opportunity to become familiar with the windows-based HYDRUS computer software packages, including several additional modules, such as the ROSETTA, HP1, UNSATCHEM, and Wetlands modules. Emphasis will be on preparation of input data for a variety of one- and multi-dimensional applications, and interpretation of simulation results. Selected advanced HYDRUS topics will be covered during the second part of the course. The conference Hydrus Software Applications to Subsurface Flow and Contaminant Transport Problems will focus on applications of advanced numerical models simulating variably-saturated flow, heat transport, and transport of various substances (nutrients, pollutants, pathogenic microorganisms) in soils and groundwater. Similarly as very successful earlier workshops in this series (Utrecht in 2006, Prague in 2008, Tokyo in 2008) the 4th workshop will bring together a mixture of world-leading as well as junior scientists and engineers from different branches of the soil, hydrologic, and environmental research communities. The workshop is not limited to applications involving the use of HYDRUS and its modules. Applications of other numerical tools (e.g., Tough2, SWAP, MACRO) are encouraged and welcomed also. Registration: Graduate students - $295; Faculty and post doctoral researchers - $395; Non-university personnel - $495. To register, please contact Barbara Guieb: barbarag@hawaii.edu. Course participants should bring their own personal laptop computer (Minimum system requirements: operating system Windows XP/Vista, Windows 7, X86 CPU with 1 GHz, 512 MB RAM, 10 GB total hard disk capacity with about 500 MB reserved for installation, graphic card with a resolution of 1024 x 768 pixels). Registration: Undergraduate and graduate students - ￥2000. Faculty and post doctoral researchers or Non-university personnel - ￥3000. To register, please contact TurnTech: marketing@sciencesoftware.com.cn. Registration and other details: http://www.sciencesoftware.com.cn/Training_detail.asp?id=141. Location: Albert Katz International School of Desert Studies at the Sede Boqer Campus of the Ben-Gurion University in Israel. 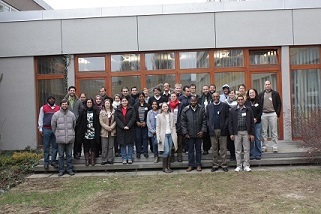 The course begins with a detailed conceptual and mathematical description of water flow and solute transport processes in the vadose zone, followed by a brief overview of the use of finite element techniques for solving the governing flow and transport equations. Special attention is given to the highly nonlinear nature of the governing flow equation. Alternative methods for describing and modeling the hydraulic functions of unsaturated porous media are also described. "Hands-on" computer sessions will provide participants an opportunity to become familiar with the Windows-based HYDRUS-1D and HYDRUS (2D/3D) software packages. Emphasis will be on the preparation of input data for a variety of applications, including flow and transport in a vadose zone, variably saturated flow through a dam, flow and transport to a tile drain, and two-dimensional leachate migration from a landfill through the unsaturated zone into groundwater. Calibration will be discussed and demonstrated by means of a one-dimensional inverse problem. 3000 NIS for personnel from private companies, research institutes or other universities. 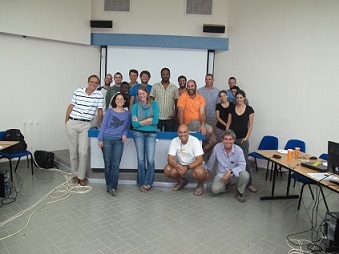 The course begins with a detailed conceptual and mathematical description of water flow and solute transport processes in the vadose zone, followed by an brief overview of the use of finite element techniques for solving the governing flow and transport equations. Special attention is given to the highly nonlinear nature of the governing flow equation and to biogeochemical processes occurring in constructed wetlands. Alternative methods for describing and modeling the hydraulic functions of unsaturated porous media are also described. 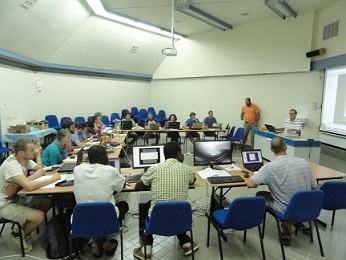 "Hands-on" computer sessions will provide participants an opportunity to become familiar with the Windows-based HYDRUS-1D and HYDRUS (2D/3D) software packages, as well as its biogeochemical WETLAND module. Emphasis will be on the preparation of input data, proper placement of boundary conditions, and employment of inverse modeling for a variety of applications, including flow and transport in a vadose zone, two-dimensional migration through the unsaturated zone into groundwater, and fate and transport of reactive chemicals in vertical, as well as horizontal flow constructed wetlands. Calibration and parameter determination will be discussed and demonstrated by means of a one-dimensional inverse problem. Details to be posted later. Under construction. We regret to inform you that we have decided to cancel this HYDRUS/Wetlands short course in Bogota, Columbia. While we have been both (myself and Guenter) looking forward to provide the course and made all needed preparations on our side, we have been simply unable in recent months to communicate with local organizers from "Universidad EAN at Bogotá, Colombia". They completely stopped responding to our emails and updating us about local preparations for the short course. Without the local support, we had no other choice but to cancel the short course.